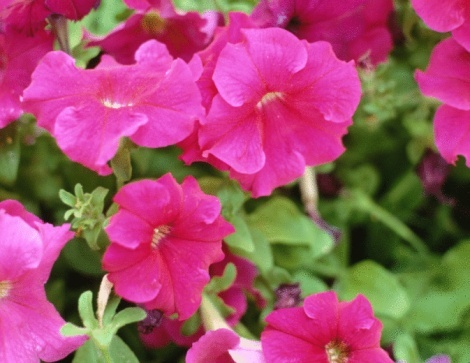 Petunias are typically treated as annuals. They are planted in the spring, bloom throughout the warm months and then die in the fall when temperatures begin to drop. Petunias, though, are actually perennials. In year-round warm climates, they survive and sometimes bloom throughout the winter. If you want your petunias to grow back in the spring, store them indoors during the winter. According to Nature Hills Nursery, you can potentially get three or more years out of one plant before it stops performing. Store petunias indoors during the winter to grow them again the next year. Dig up petunias in the fall before the first frost. Examine the plants thoroughly for pests before you bring them indoors for the winter. If you see pests, treat the plants with an appropriate insecticide or insecticidal soap. Plant the petunias in individual pots. Use all-purpose potting soil and keep the petunias planted at the same depth as they were outdoors. Cut the petunias back about 1 to 2 inches above the soil line. Use sharp, sterile hand clippers. Water the petunias to moisten the soil thoroughly. Take them to an area that is cool, but still above freezing. An attached garage is often a good place to store petunias during the winter. Check the petunias every three to four weeks and, if the soil completely dries out, give them some water to moisten the soil. Replant the petunias outdoors in the spring after temperatures have warmed and the danger of frost is over.